Only 4.2 miles from Main Street, 1851 Vineyards is the closest estate winery to Fredericksburg. Settled over a century and a half ago, the historic farm, with German architecture and majestic oak trees, started as a flour mill. In 2013 the transformation to an estate winery began. This winery is the realization of our journey, built on dreams, perseverance, and family heritage. 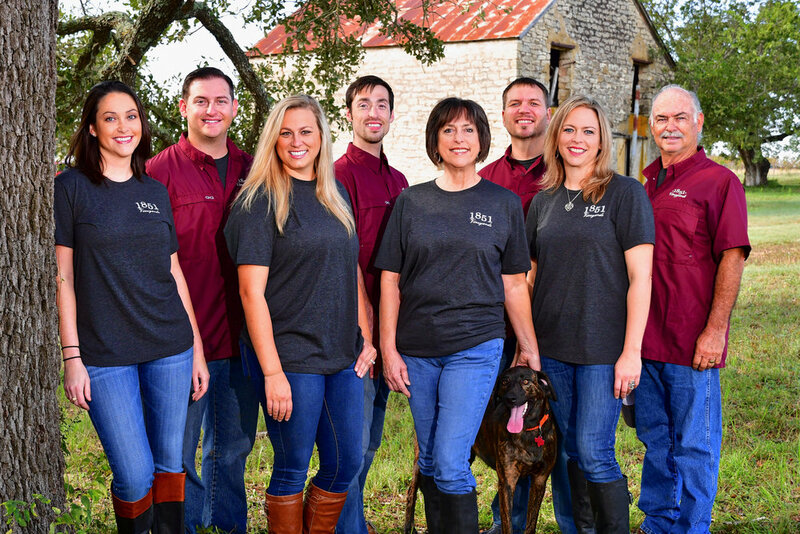 1851 Vineyards is dedicated to exceptional wine and true Texas hospitality. Come and escape the city hustle at our tranquil Hill Country winery. As you unwind in the shade, explore with your own customized wine-tasting journey, surrounded by ancestral buildings and rolling vineyards. Our estate vineyard includes such varietals as Chardonnay, Albariño, Petite Sirah, Malbec, Cabernet Sauvignon, Tempranillo, and Tannat. We are open Thursday-Saturday from 11:00-6:00 and Sunday from 12:00 to 5:00. Please call (830) 391-8510 or book.1851vineyards.com to make your reservation. The 1851 family welcomes you.